Being able to batch convert PDF to JP is one of the most difficult, yet important processes when dealing with PDF documents. A batch PDF to JPG conversion tool can save you a lot of time and money and is often ideal for those moments when you need to quickly convert a large number of PDF files into JPG. The main advantage of a good batch PDF to JPG converter is therefore the ability to save you time by quickly and effectively converting a huge number of PDF to JPG. In this article, you will be introduced to method to a PDF to JPG batch converter that does just that as well as two further solutions that can also help. The only program you should think about using when converting batch PDF to JPG is iSkysoft PDF Editor 6 Professional for Mac (or PDF Editor 6 Professional for Windows). The reason is simple; this program is a complete PDF management tool that is able to provide you with all the tools you need to effectively manage your PDF files regardless of the number and size. Its batch conversion properties are impressive and it also comes with a whole host of other feature that anyone who works with PDF documents will find very useful. 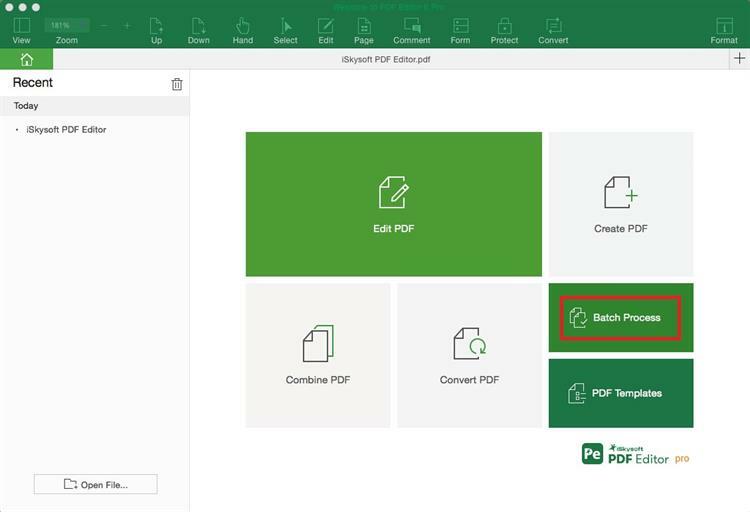 Let's take a look at how to batch convert PDF to JPG using iSkysoft PDF Editor Pro 6. Begin by installing iSkysoft PDF Editor on to your computer. Launch the program to begin the process. The next step is to import all the files you need to convert to JPG. This program makes that very easy simply click on "Batch Process" in the main window, select "Convert > Add Files" and then add as many files as you need. On the right side toolbar, select the output format as "To Image" and then click on "Convert" to begin the conversion process. You can then save the files once conversion is complete. As a premier PDF management program, iSkysoftPDF Editor 6 Professional for Mac (or PDF Editor 6 Professional for Windows) needs to have the right features to make the processing of PDF document easier and it does. This is the primary reason why it is the ideal tool for anyone dealing with PDF documents on a regular basis. If you have been searching for the right PDF management program for a while now, you've no doubt come across some great tools. But what does iSkysoft PDF Editor have over them? Why should you choose it over others? Well, the following features should help you make up your mind. It can be very easy to use this program to create a PDF document. The process is as simple as opening a file within the program to automatically convert it to PDF. Editing the text and images in the program is also quite easy. With a simple user interface, you are easily able to locate the necessary tools to edit both text and images on the document. It also comes with a range of markup and annotation tools that you'll find very useful. You can easily add comments and stamps to a document or even highlight and underline text. 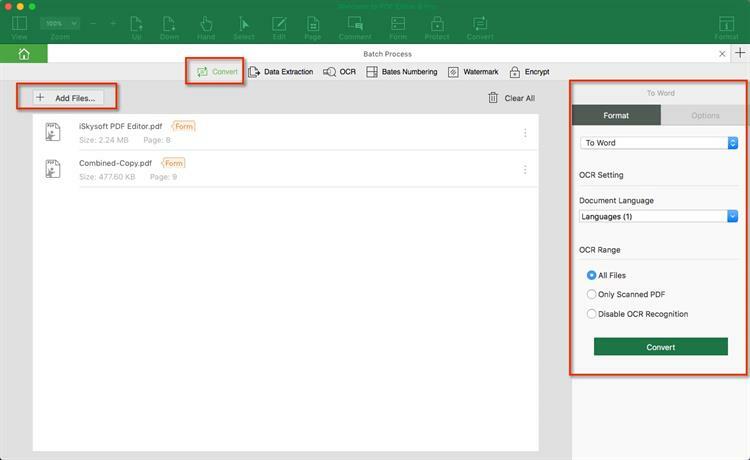 It also has powerful document protection features that include password protection, text redaction and adding a signature to authenticate a document. Another way you can batch convert PDF to JPG is to use an online tool. There are very many different types of online tools that can convert PDF files to JPG images but very few allow you to convert multiple files at once. One of them is PDF to Image, a simple online batch PDF to JPG conversion tool that allows you to upload as many files s you want and convert them to JPG quickly and easily. Step 1. On any browse, go to PDF to Image official website and you should see a large "upload Files" button. Click on it to begin adding the files you need to convert. Alternatively, you can simply drag and drop the files into the area marked "Drop Files Here." Step 2. Once all files are added to the site, the program will immediately begin converting them to JPG. When the process is complete, you can then just simply click on the "Download All" button to download the resultant ZIP files. Note: This and other online tools of the same kind can make the process of converting multiple PDF documents to JPG, but may have numerous shortcomings. For example, with this tool, you are not able to upload files exceeding 50MB in size. This means that it may not be ideal for you if the documents you want to convert are large or too many. But perhaps the biggest disadvantage of using online tools is in the safety of the document and the content. Uploading a document online is a risky affair and may compromise the safety of your documents and the data on it. So if you are going to use a PDF to JPG converter online be careful and only use tools that guarantee to delete the file as soon as conversion is complete. Adobe Photoshop is the ultimate photo and graphic editing tool. This paid tool can be intimidating to many, especially if you don't know how to use it. But Photoshop can come in very handy when converting most files, not just PDF to image formats like JPG. That's because it comes with the inbuilt capability to export or save any file opened in it to an image format of your choice. To batch convert PDF to JPG in Photoshop, you will first of all need to install the program on to your computer. You may need to purchase a subscription, although there is a free trial you can use. With Photoshop installed on your computer, follow these simple steps to convert PDF to JPG. Step 1. Begin by opening Adobe Photoshop CC on your computer. You may be required to sign in to your account or create a new one if you haven't already. Step 2. Click "File" and then "Open" in the main menu and select the PDF document you want to convert to JPG. Step 3. 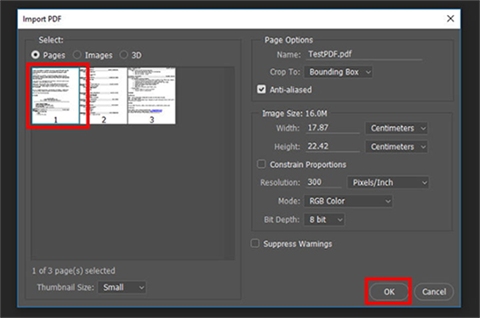 In the popup window, choose the page you want to convert to JPG and click "OK." If you want to convert more than one page, select all of them and each will be converted to a single image. Step 4. Now click on "File" and then choose "Save As." In the resultant window, click on the drop-down menu under "Save as Type" and select "JPEG" format. Add a file name and then click on the "Save" button to compete the process. 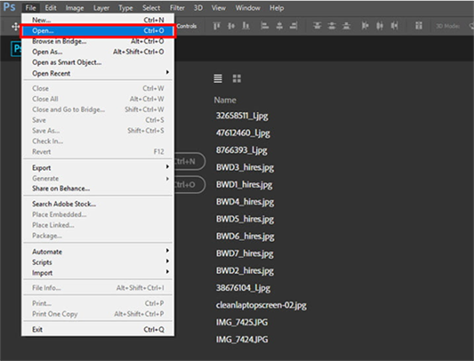 Photoshop makes the process of converting PDF to JPG very easy. But as you can see from the process above it is not entirely possible to add and convert multiple PDF files at once. It is however capable of easily converting even the largest of PDF files to JPG.